Just like the return to Daylight Saving Time gives us a much-welcomed extra hour of sunshine, these drinks turn up the light. 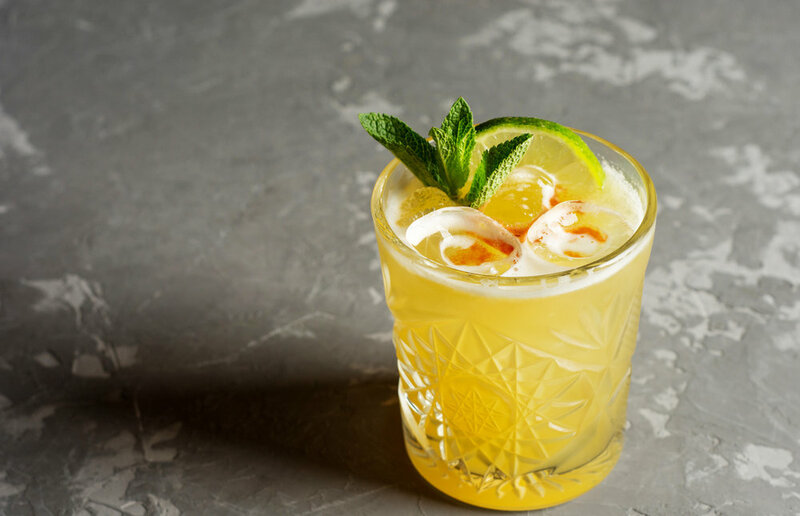 Enough with brooding and boozy; we are craving these refreshingly aromatic, irresistible cocktails to throw back during the golden hour. All of the drinks at this sophisticated Southern cuisine-focused restaurant and lounge in Dublin, Ohio are named after tunes, and the spring menu in particular drinks like a playlist of a story about love and love lost, Plymale says. This sip is an ode to the Travis Scott song about the phenomenon of how small decisions and changes in one place can have large effects elsewhere. “It’s very refreshing and has a great mouthfeel,” he says. “Genmaicha rice tea syrup gives the cocktail a very unique flavor and balances well with the Crème de Violette. Lavender bitters offer floral notes that pair great with the chamomile-infused gin. Add all ingredients except garnish to a cocktail shaker and shake without ice until frothy. Add ice to the shaker and shake again until well-chilled. Double-strain into a coupe glass, spritz with the Crème de Violette and garnish with the lavender flowers and dehydrated lemon zest. Add 1 cup water and 1 cup white sugar to a small saucepan, bring to a boil and then simmer until sugar dissolves. Add 2 teabags (or 2 teaspoons) genmaicha tea and let steep for 5 minutes or until desired flavor is achieved. Strain out solids and store the syrup in the refrigerator. Add the first four ingredients to a cocktail glass, add ice and stir until well-chilled. Strain into a rocks glass over one large ice cube, express and discard grapefruit peel on top and garnish with the pickle and asparagus spear if using. Take 1 lb. crushed white asparagus and add it to a 750ml bottle of Cocchi Americano. Cryovac it and then sous-vide at 50 degrees Celsius for 3 hours. (Alternatively you can low simmer it in a pot.) Strain out solids and store the vermouth in the refrigerator. This Margarita variant swaps out lime juice for lemon and adds the fresh herbal aroma of basil leaves. If you want to lighten and lengthen it, serve it in a Collins glass topped with club soda or citrus-flavored seltzer. Rub the outside of a rocks glass with the lemon wedge, coat half of it with the sugar and salt mixture and set aside. Add the Tequila, orange liqueur, lemon juice and simple syrup to a cocktail shaker, add ice and shake until well-chilled. Strain into the prepared glass and garnish with the basil leaves (give them a smack first) and lemon wedge. On the menu at Komodo in Miami, this is a fruitier version of the Negroni with the ABV tempered with vermouth and citrus juice. “The citrus notes of the orange and lime mixed with the bitter notes of the Campari make this drink a perfect aperitif for spring,” Ansaldi says. Add all ingredients except garnish to a cocktail shaker, add ice and shake until well-chilled. Strain into a rocks glass over fresh ice and garnish with the lemon peel. One sip of this drink will transport you to a citrus grove in the Amalfi Coast or a lavender field in the South of France. Bergamot liqueur and orange flower water are best paired with a modern, citrus-forward style of gin, such as D. George Benham Sonoma Dry, silver medalist in the 2018 NYISC. Add all ingredients except garnish to a cocktail shaker, add ice and shake until well-chilled. Strain into a coupe and garnish with a dried lavender sprig attached to the glass with a tiny clothespin.